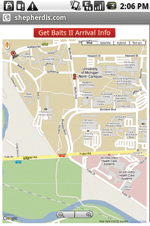 Five years ago, a team of U-M engineering students led by Professor Christopher Ruf set out to design a global positioning system (GPS) capable of monitoring buses. The resulting software program—known as Magic Bus—functioned as a highly accurate tool for predicting time of arrival. Most of the students never imagined that their Magic Bus technology would be spun out into a start-up, or that it would one day provide real-time fleet management services to universities, businesses, and municipal governments. Team member Jahan Khanna was the exception. In 2009, he began upgrading the technology—making what was essentially a passenger tool and transforming it into a multi-functional software platform. Khanna co-founded Shepherd Intelligent Systems (SIS) in 2009. That same year, Adrian Fortino came on board as partner and CEO. A U-M grad with an undergraduate degree in mechanical engineering, an MBA, and considerable experience in the world of venture capital, Fortino was impressed with the start-up's potential and excited "at the prospect of leading a scalable company." Together, Khanna and Fortino rethought, reconfigured, and repositioned the SIS technology, transforming it from a passenger tool into a dynamic resource for fleet management. Within a matter of months, SIS technology was being used by the Ann Arbor Transportation Authority (AATA), the City of Ann Arbor, and U-M Parking & Transportation Services (PTS) as well as municipal vehicle fleets, taxi companies, and limousine services throughout the country. "Although our system still has a strong passenger service component, which provides electronic bus arrival alerts and real-time vehicle mapping to thousands of riders daily, its real value lies in the fact that it offers a complete, real-time fleet management solution," says Fortino. "With our technology, fleet managers can minimize fuel consumption, improve route efficiency, deploy workers and vehicles more effectively, optimize passenger loading, and monitor drivers. And the fleets can use their own GPS hardware system to do it since we provide a hardware- agnostic software platform." Nationally, SIS works not only with public transit route based fleets but also with demand-based fleets such as taxi and limousine services as well as municipal fleets of cars, trucks, and snow plows. Examples abound of how customers continue to discover new ways of deploying—and benefiting from—the technology. For one City of Ann Arbor project, SIS software was installed on snowplows and a site was created to show how much progress drivers had made in their assigned areas. Text messaging and e-mail functions made it possible for fleet managers to communicate directly with snowplow operators, and to redirect trucks as needed. As another example, a locally-based limousine fleet integrated SIS software with its database, thereby adding online capabilities—including location monitoring and digital communications—to what had been a telephone-only dispatch service. According to Fortino, SIS has enjoyed "a great relationship" with U-M Tech Transfer. "They were very helpful during the technology licensing process," he says. "But even more significant is the support they've provided, offering advice, working with us to develop networks, and serving as a bridge with key customers." These days, it's clear that SIS is on a roll. Interest in the technology continues to grow, and the company is in the process of building a nationwide customer base and responding to requests from as far as Bangalore, India. 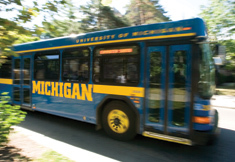 Over the course of the Magic Bus technology implementation, the University of Michigan has seen a 22 percent increase in ridership. Also, approximately 85 percent of all U-M bus passengers use the SIS system to receive route updates and alerts via e-mail and text messaging.